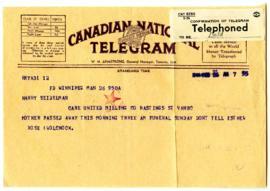 Telegram from Rose Wolchock, a relative in Winnipeg, to Harry Seidelman in Vancouver. It informs Harry Seidelman that Rose's mother passed away. 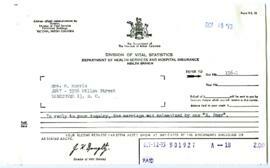 Telegram is dated February 26, 1944 at 7:55 AM. Letter from [Mac McLaren], presumably a friend of Bill Seidelman, sent to Bill Seidelman thanking Bill for sending him a photograph of the "early class" at Macdonald Elementary School in Vancouver. Letter is dated June 13, 1973. A list of photographs pertaining to the Seidelman family compiled by Irene Dodek and Ann Krieger, dated November 5, 1973. List is paper-clipped with a Seidelman family biography (see Item 2 in this file). An undated handwritten biography of the Seidelman family by an unknown author. Biography is paper-clipped with a list of photographs of the Seidelman family (see Item 1 in this file). Obituary of a Seidelman family member. Assumed to be written in Yiddish.